Botanical, vertebrate, and invertebrate biodiversity varies among sites. Althoughall portfolio sites in the Hawaiian ecoregion haveconservation value, identifying a subset of sites for immediate actionprovides priorities under conditions of limited capacity and urgentthreats. Ideally, we want to focus attention soonest on those sitesbearing a combination of: 1) highest biodiversity value, 2) urgent, butaddressable threats, and 3) greatest feasibility and leverage. Raw species diversity contributes to conservation value of a site. 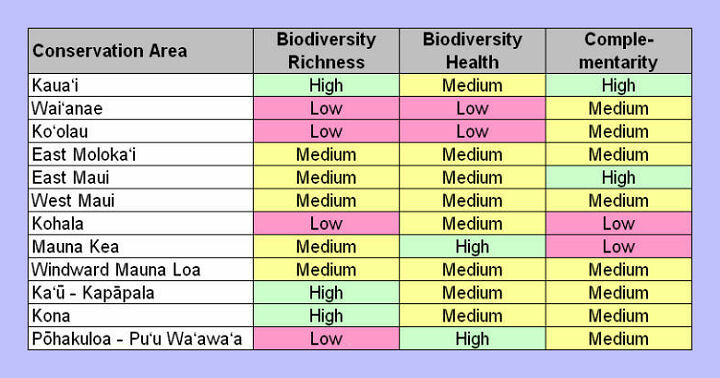 Biodiversity Richness --overall numbers of species, natural communities, ecological systems,and special features. 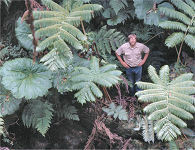 Some areas with great botanical richness (e.g., Wai‘anae) scored much lower in ecological system, natural community, and special feature richness. Biodiversity Health --indication of overall site viability, derived largely from overallecological system target viability scores. Health scores were typicallyinversely proportional to level of threat to conservation targets ofthe area. Complementarity-- ability of sites to contribute to overall ecoregion biodiversity, aspercent additions of selected species (flowering plants), naturalcommunities, and ecological systems. Feasibility of doing conservation work at a site is determined by many factors that affect opportunity costs. Feasibilityand opportunity can change according to many factors, including practical logistics of management access, currentlandowners/managers, political and social incentives and disincentives,public support for conservation actions, pertinent policies and lawsmandating protection, history of conservation effort, regional economic health, and capacity ofconservation partners. Analyses of these factors are continuallyunderway by conservation planners. Remaining sites within the portfolio are approached as partnershipsites, recognizing their conservation value, and driven by opportunity.We are committed to their protection and management, but look toconservation partners to lead efforts while we play a more supportive rolein the appropriate partnership efforts. Whetherpriority action sites, portfolio sites, or other areas of conservationvalue, the driving conservation issue is management and abatement ofthreats to species, communities, and ecological systems. Conservation Value of the Portfolio Conservation Areas: Assessments of biodiversity richness, health, and complementarityacross the conservation areas of the ecoregion portfolio.